As the capital city of Spain, Madrid is nowadays considered one of the most interesting "food towns" in the world. This is perhaps due to the wide variety of specialty dishes that its cuisine boasts, ranging from the old-fashioned and traditional to the modern, and even the futuristic; a cuisine that has consistently received high praise from the likes of New York Times' critic Mark Bittman and TV celebrity chefs such as Anthony Bourdain and Mario Battali, to name just a few. But how did a once humble and unsophisticated city like Madrid become the vibrant food metropolis that it is today? How did contemporary madrileno cuisine come to be, and what are its main identifying dishes? What role have its legendary restaurants, cafes and markets played in putting Madrid in the map as one of the world's top food destinations? Maria Paz Moreno looks at the gastronomical history of Madrid throughout the ages. 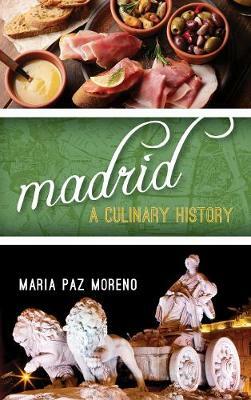 She traces the historical origins and evolution of Madrid's cuisine, exploring major trends, most innovative chefs, restaurants and dishes, and telling the story of this fascinating city from the point of view of a food lover. She discusses the diverse influences that have shaped Madrid's cuisine over the centuries, including the introduction of foods from the New World since the 16th century, the transition from famines to abundance during the second part of the 20th century, the revolution of the Michelin-starred young chefs at the beginning of the 21st century, and how madrilenos' sense of identity is built through their food. The sense of community created through communal eating experiences is also explored, focusing on the culture of sharing tapas, as well as traditional and avant-garde eating establishments, from restaurants to bars to chocolaterias, and even markets and festivals where food plays an important part. Anyone wishing to know more about the city, the culture, the richness of its food and people, will find a delightful review in these pages.